Samantha Keely Smith is an artist based out of New York City known for her expressive abstract landscape paintings. Her work reveals a tangible intersection of the inner emotive individualized self with the beautiful, but hostile external world. Smith achieves this through the softness of her brushwork and the stark contrast of colors. Through this constructed conflict, she creates a scene that is attempting to find peace – whether with herself or with her surroundings in the world around her. 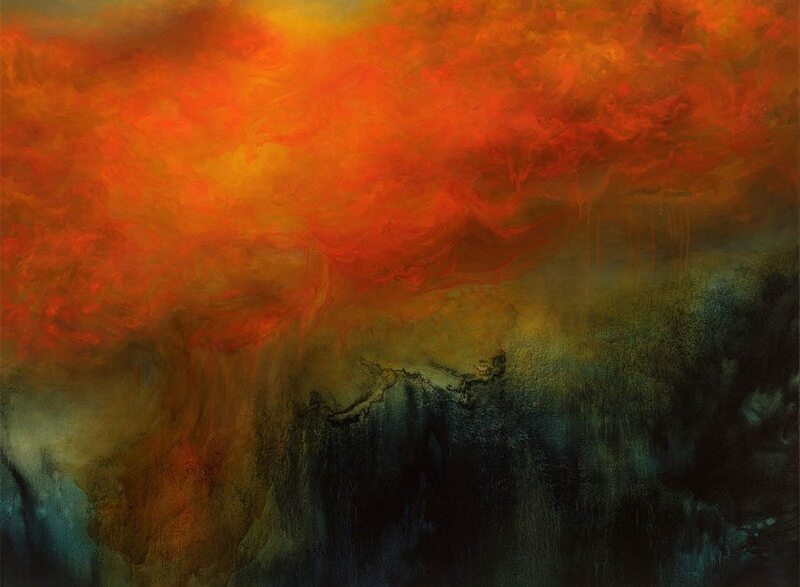 In her piece, she depicts a fiery scene, inflamed with wisps of red, orange, and yellow. They rise, as if coming up from the land down below, forming a cloud over the dark and rocky mountainous range. The fire becomes emblematic of one’s personal inner emotions that can no longer be contained. Through creating a gradual path for these flames, Smith is suggesting the constant release of these emotions that finally culminate into a huge fire. Her use of fire as the product of this release forces us to assume these must be negative feelings. As humans, we are not predisposed to hold in these negative feelings. Thus, after bottling them up for awhile, they ultimately must be shared in an explosive manner, seeping into the world around. The way she breaks away from her more familiar color palettes result in the ultimate paradox that encapsulates how we deal with ‘emotional baggage.’ Despite (or due to) the sheer force of emotions we all experience at different points of our lives, we often bottle them up, both casually and subconsciously. Do you willingly open up to your own feelings, whether to let them express or define you? Or would you rather proceed with daily life without the confusing, burdensome, or sometimes undecipherable assortment of paradoxical emotions? Does it have a positive effect on our well-being to repress our emotional life? Perhaps a good starting point may be to figure out— what kind of emotions does this painting extract from you? Do you willingly open up to your own feelings, whether to let them express or define you? I love the contrast of blue and orange in this painting; her choices from opposite ends of the color wheel create conflict with each other but also help each color to stand out on its own.